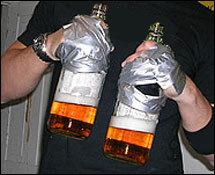 Edward 40 Hands – In order to play this game all you need is duct tape and two 40′s of beer for each person. You tape one 40 to each of your hands and you can’t take them off until both of the 40′s are empty. This means that if you need to go to piss you either chug the beers or wet yourself. You can’t answer your cell phone, or basically do anything until you drink the 2 40′s completely.